. . . I'm a Scrapaholic. You no longer need to be closely trailing me to learn that. Of course, if you are, you'll see my customized frame, too -- but with the new tag, you pretty much can't miss it. 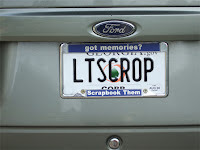 Of course, it's possible that only scrapbookers will understand what my new tag means, but oh well. I'm just glad the DMV didn't screw up and include an A where there's currently an O. Good Point - Let's Crap Everybody!